7-120: Ashwin run out 1 (1) India XI: Shikhar Dhawan, Rohit Sharma, Virat Kohli, Dinesh Karthik, Suresh Raina, MS Dhoni (capt & wk), Ravindra Jadeja, R Ashwin, Bhuvneshwar Kumar, Ishant Sharma, Umesh Yadav. Kane Williamson's batting (67 off 54 balls) brought New Zealand within 10 runs of the target, but England claimed the victory needed to advance to the semis of the ICC Champions Trophy in Cardiff. Captain Alastair Cook made an excellent 64 of 47 balls, and was dropped on 14, 37 and 45 by Nathan McCullum, in a match that was delayed by nearly five hours due to incessant rain. England posted 169 from a reduced 24 overs, despite a late collapse. Nathan McCullum ended up taking four catches in total. After South Africa posted 230/6 in their 31 overs, West Indies made 190/6 in 26.1 overs before rain stopped play. Kieron Pollard (28 off 23) was out on the final delivery before rain stoppage, and if he had kept his wicket intact, West Indies would have won the match and qualified for the semi-finals. Instead they finished level with the Duckworth/Lewis par score, the match finished in a tie and South Africa progressed to the semi-finals. Kumar Sangakkara's unbeaten 134 off 135 balls and some mighty blows by Nuwan Kulasekara powered Sri Lanka to a seven-wicket victory over England in a high-scoring thriller on Thursday. England was on course to clinch a semifinal berth after posting 293/7 under The Oval lights, but Sri Lanka made light of the imposing target by beating England with 17 balls to spare to stay alive in the tournament. England must now beat New Zealand in Cardiff on Sunday to guarantee reaching the last four. Shikhar Dhawan hit his second straight ton in the Champions Trophy as India crushed West Indies by eight wickets to book a place in the semis. 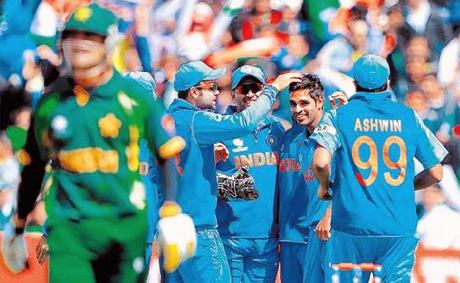 India reached their target of 234 with more than 10 overs to spare. They restricted their opponents to 233 for nine as Ravindra Jadeja (5/36) ripped through the middle-order and then openers Dhawan and Rohit Sharma (52) added 101 in only 15.3 overs. Karthik hit eight boundaries in his 54-ball knock of 51* as he added 109 runs for the undefeated 3rd wicket stand with Dhawan.Reported earlier: India, the reigning 50-over World Cup champions, will meet West Indies, the current T20 World champions in the Champions Trophy at The Oval today. India have won eight of their last 11 one-dayers against the West Indies over the past three years. The last time they clashed at the same venue was in the 1983 World Cup final, in which India upset the then world champions West Indies to win their first major tournament. India (from): Mahendra Singh Dhoni (Captain), Ravichandran Ashwin, Shikhar Dhawan, Ravindra Jadeja, Dinesh Karthik, Virat Kohli, Bhuvneshwar Kumar, Amit Mishra, Irfan Pathan, Suresh Raina, Ishant Sharma, Rohit Sharma, Murali Vijay, Vinay Kumar, Umesh Yadav. West Indies (from): Dwayne Bravo (Captain), Tino Best, Darren Bravo, Johnson Charles, Chris Gayle, Jason Holder, Sunil Narine, Kieron Pollard, Ravi Rampaul, Kemar Roach, Darren Sammy, Marlon Samuels, Ramnaresh Sarwan, Devon Smith. James Anderson claimed 3-20 as England opened their Champions Trophy campaign with a 48-run victory over Australia at Edgbaston. Ian Bell top-scored with 91 in England's 269/6, while despite a 55 from stand-in skipper George Bailey and James Faulkner's unbeaten 54, Australia could only reach 221/9. World champions India began their Champions Trophy campaign with a 26-run victory over South Africa with the help of Shikhar Dhawan (114), who hit his first ODI hundred and shared a stand of 127 with Rohit Sharma (65). Raveendra Jadeja made a rapid unbeaten 47 as India posted 331/7 in Cardiff in the first match of the tournament, having been put in to bat first. In reply, South Africa were 305 all out. Umesh Yadav took the first five Australian wickets to fall, as they collapsed to 34 for six wickets by the end of the 12th over and were eventually bowled out for a paltry 65 in 23.3 overs. Paceman Ishant Sharma supported Yadav well by taking 3 for just 11 runs in his five overs.Earlier, opting to bat first, India fought back from 55/5 and rattled up a challenging 308 for six. Karthik smashed an unbeaten 146 (140 balls, 17 fours and a six) and added 211 runs for the sixth wicket with skipper Mahendra Singh Dhoni who scored 91 (77 balls, 6 fours and four sixes). Virat Kohli (144) and Dinesh Karthik (106 not out) lead India to a five-wicket win over Sri Lanka in their warm-up match for the Champions Trophy at Edgbaston on Saturday. They were in a tight spot losing 4 for 110, chasing 333 in a match in which both teams could use as many players from the squad of 15 with any 11 batting/fielding.Earlier Sri Lanka scored a highly competitive 333 for five with the help of an opening partnership of 160. Kusal Perera opted to retire on 82, and was soon followed by Tillakaratne Dilshan, who walked off with 84. Experienced batsmen Gautam Gambhir, Virendra Sehwag and Yuvraj Singh were left out of India's 15-man squad for the Champions Trophy. Left-handed opener Shikhar Dhawan, wicket-keeper batsman Dinesh Karthik - who was recalled after almost three years - and opener Murali Vijay, are the latest additions.India, the reigning 50-over world champions, are in Group B and will play the opening match of the June 6-23 tournament against South Africa in Cardiff. Pakistan and West Indies are the other teams in the group. India Squad: Mahendra Singh Dhoni (Captain), Murali Vijay, Shikhar Dhawan, Dinesh Karthik, Virat Kohli, Suresh Raina, Rohit Sharma, Ravindra Jadeja, Ravichandran Ashwin, Amit Mishra, Irfan Pathan, Umesh Yadav, Bhuvneshwar Kumar, Ishant Sharma, R. Vinay Kumar.